By air, London City airport is definitely most convenient for the O2, but this is not a big airport, mostly local and business. Main airport is Heathrow. Budget airport Stanstead. Another major airport: Gatwick. A bit remote another budget airport: Luton. This link gives all relevant information: The O2 - Getting There. To quote from the site: The Jubilee Line is the only London Underground route that connects with all others - so national rail passengers from north, south, east or west can transfer easily to The O2�s North Greenwich station, in zone 2. The Docklands Light Railway (DLR) also provides close connections at Canary Wharf, Cutty Sark and Greenwich. Enjoy one of the world's great rivers, and travel to The O2 by hi-speed boat. Provided by Thames Clippers, services will start when The O2 opens in July. Eurostar and London City Airport are just minutes from The O2 itself, offering easy access from all over the UK and Europe. "The Express by Holiday Inn hotel in London Greenwich is a contemporary 162 bedroom hotel situated on Greenwich Peninsula, just minutes walk from the 02" Reservations: 0870 400 9092 This is not so much of a recommendation, more of a tip for a hotel which seems very close to the venue. Greenwich itself is full of places to stay, but the venue is so easy to get to, as long as you stay in a place reasonably close to transport links, I would say almost anywhere in London is viable, depending on your budget! Needless to say London has plenty of each. The obvious place to point out is Bill Wyman's Sticky Fingers Restaurant. Address: Sticky Fingers' Cafe, 1a Phillimore Gardens, Kensington, London W8 7EG. Nearest Tube: High Street Kensington. District and Central Line. Bus: No. 31, No. 28, No. 9. 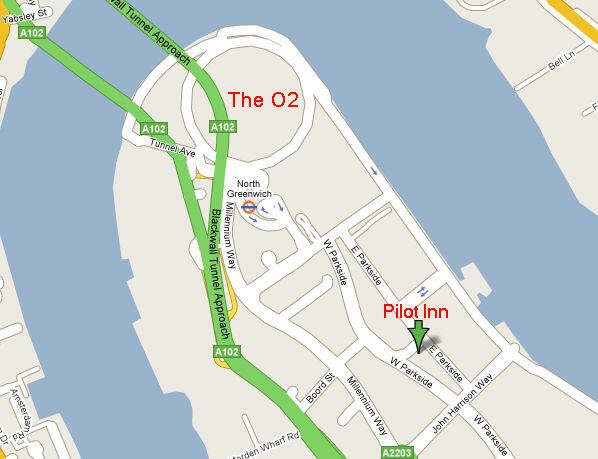 General information: Historic pub dating back to 1801, close to the O2 (a.k.a. Millennium Dome). Taken over by the Fuller Brewery like a lot other great pubs, but it seems they have kept everything like it used to be. Underground & DLR map. North Greenwich is next to the venue, if arriving at City airport, take DLR to Canning town, then change for Jubilee line. If staying in London for a few days, pick up a copy of Time Out to see what's happening that week - available at virtually every newsagent It's worth pointing out that August 26/27 is when Notting Hill Carnival takes place. The O2 is London's brand new premier entertainment complex comprising the O2 Arena, the IndigO2 club venue and a large Vue cinema, all housed within the Millenium Dome. We suspect that many of you will not have attended a previous concert at the venue so here is what we have managed to ascertain on a couple of recent visits there which we hope will make the Stones trip more enjoyable. There are several ways to get to the venue, but experience leads us to believe that The Tube is easily the best. Taxis will be slow (because of traffic) and expensive (circa �30 from Central London). The O2 Clipper Service is an absolutely fabulous way to travel to the venue, BUT they only run once an hour and only carry 220 people. In our view this is a delightful way to get to the show, but very high risk in terms of being late. The O2 is accessible via the Jubilee Line, London's most modern underground line and it only takes 15 minutes from Westminster or Waterloo underground stations -You can download a Tube map at www.thetube.com) - Get off the tube at North Greenwich. You are then right at the Arena! A small tip: if travelling by Tube in an eastbound direction to the venue get on at the BACK of the train if at all possible. Recently we have visited the O2 on two occasions. The day before it opened I went to ascertain the layout and did discover that it is almost totally isolated. In other words, once you're there, you are most definitely there, but there is nowhere else to go. That's fine in itself, but besides the entertainment venues there isn't really much else to see and do. This was confirmed to me when I went to the Prince concert on August 4th. There is a selection of chain bars/themed restaurants but not all are or will be open in time for the Stones shows. In my view that night these bars/restaurants could not really cope with the amount of people attending. No only were there 20,000 people there for the show, there was also an IndigO2 show, crowds attending the cinema and 1000s of tourists. At 8.30pm there were gargantual queues to get into restaurants such as Pizza Express, Nandos and all of the other establishments. All in all not that relaxing. 1) Relax in central London doing tourist things/shopping etc. or visiting your favourite bars and restaurants. Then at a time of your choosing allow 30 minutes to get to the venue. 2) Before the Prince show I went to Canary Wharf which involves getting off the Tube one stop before North Greenwich. There are many bars and restaurants here (many admittedly of a chain variety, but some nice ones). It was a very relaxing place for a pre-show drink and snack before hopping on a Tube at about 8.00pm to go to the show. It's a good relaxing option. Further details at www.canarywharf.com. 3) Greenwich itself is an absolutely beautiful part of London. Full of history and aesthetically delightful. This would be a great place to visit, but you then need to take a bus to the show. Further details about Greenwich can be found at www.greenwich.gov.uk. 4) St Catherines Dock near Tower Bridge is, I am told, a fab place to visit and it is on the way to the show. The Dickens Inn there is apparently a great place to go. Unfortunately I don't know the area, but a very good friend has recommended it as a great spot! When I attended the Prince show I was very impressed with the Arena once inside. Drinks service was superb by UK standards. A decent selection, quickly dispensed and not at stupid prices. It is amazing to think that this venue holds 20,000. It doesn't really feel that big. From what I could see every lower tier ticket really is a great ticket: wherever you are it will be a magnificent view. For the Stones this is particularly true - any seats located anywhere near the small stage will be magnificent! I didn't visit the upper tiers but they are pretty high up! As of today we don't know the Stones onstage time, but our guess is circa 9.00pm. Thanks to Daniel Nienkemper and Steven Jump (info from the O2 shows in 2007)!